Omnistar Knowledge Management Software allows you to manage information about your company or Intranet with a knowledge base to reduce time spend offering customer support. You can also improve your staff's productivity by creating a intranet with company questions and resources. Our software is the best because it will allow your staff to focus on growing your business and giving them the resources. ...... our support system in a dynamic, easy-to-use application. The best way to reduce the number and expense of support issues is to provide customers with all the support information they could need in a simple format. By making the Omnistar Knowledge Management Software robust enough to handle all kinds of support information needs, we accomplished the first part of our goal; and by also making it simple enough to leave us with lots of time for other aspects of our business, we accomplished the other. That's how Omnistar Knowledge Management Software was born. 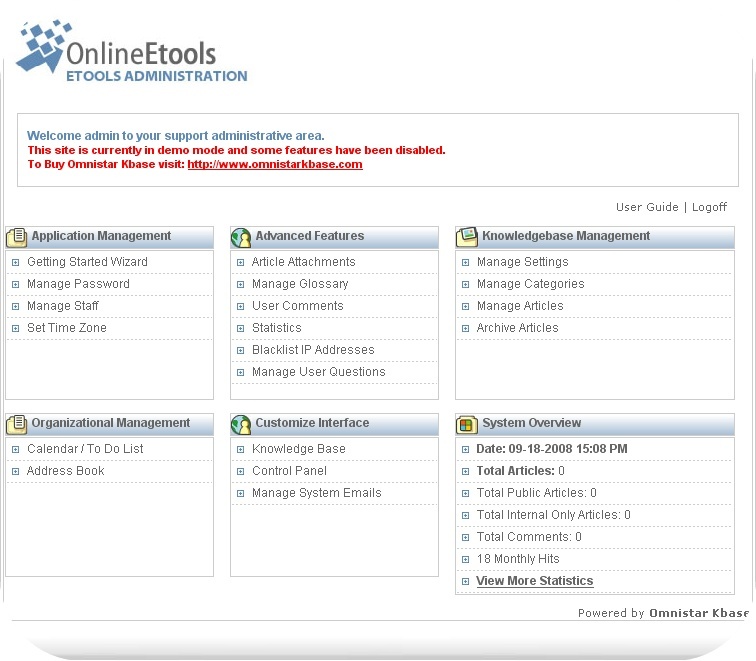 Qweas is providing links to Omnistar Knowledge Management Software 5.2 as a courtesy, and makes no representations regarding Omnistar Knowledge Management Software or any other applications or any information related thereto. Any questions, complaints or claims regarding this application Omnistar Knowledge Management Software 5.2 must be directed to the appropriate software vendor. You may click the publisher link of Omnistar Knowledge Management Software on the top of this page to get more details about the vendor.